In earlier parts of this series, we introduced some ideas about Model-Based Systems Engineering (MBSE) approaches to the development of Autonomous Vehicles (AVs). Our specific interest in this series is the modeling of requirements in combination with functional architecture, software configuration repositories and project management. 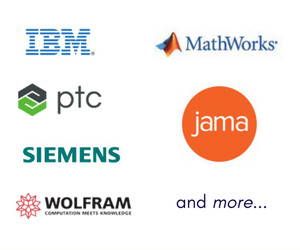 We have used Syndeia, the MBSE platform from Intercax, to provide connections between software tools to create a consistent Total System Model (TSM). The connections created, both between model elements in different tools and within the individual models, make up a graph, a set of nodes and edges. As the size of graph increases, we can make use of powerful new graph database technologies to visualize and query this graph. This gives us a detailed roadmap of system information with unprecedented traceability. Syndeia provides several graph visualizations. 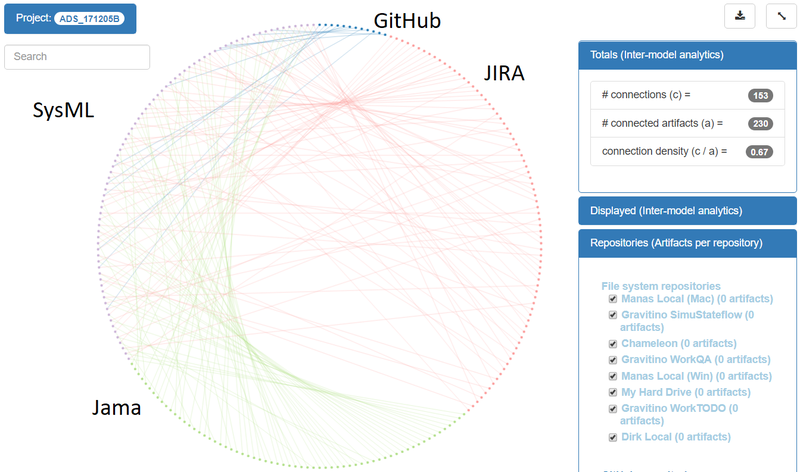 Figure 1 shows all 153 inter-model connections created by Syndeia between Jama, MagicDraw, JIRA and GitHub. The peripheral circles represent model elements and the chord lines the connections between them. 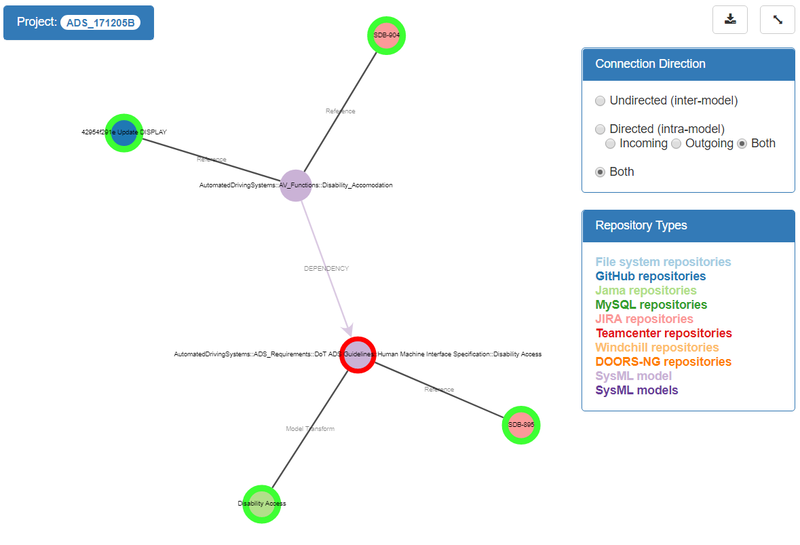 An alternative visualization in Figure 2 is initiated from a specific element (the SysML requirement “Disability Access” in this example) and shows nearest connected neighbors, both within the SysML model and to other models. These adjacent nodes can be incrementally expanded to show extended chains of connection across the TSM. 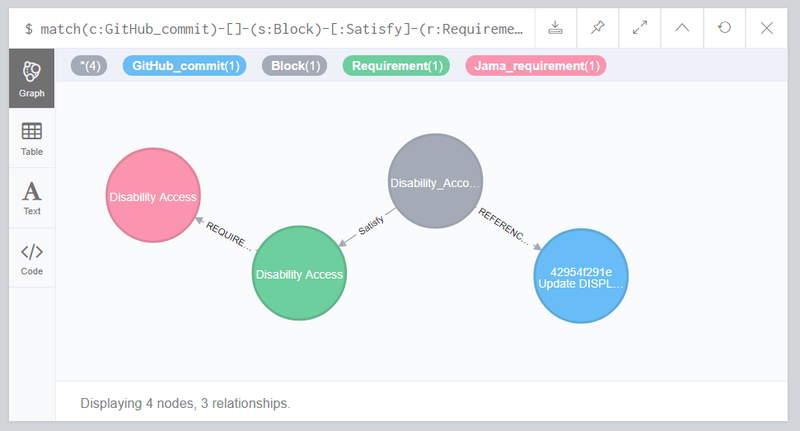 The most flexible approach has Syndeia collecting all connectors, both intra-model and inter-model, in a Neo4j database and using a standard query language, Cypher, to ask detailed questions of the TSM. In Figure 3, the query asks for all GitHub-versioned software modules (Commits) connected to the Jama requirement for Disability Access. One such Commit is identified, via a chain of three connections pulled from a graph database of 576 connections between 259 nodes. With such techniques, generating and documenting targeted traces across large models with thousands or millions of elements becomes practical. This example has only focused on linking Requirements and Functions. The same approach can be extended to connecting Functions and Physical Structure, or Structure and Simulation, involving additional engineering software tools for PLM, CAD, simulation, and others. Syndeia is adding new capabilities to support this effort. In Syndeia 3.2, release in January 2018, Syndeia will support direct Reference Connections from Jama to JIRA and GitHub. It will also support user-defined customized Model Transform mappings of attributes and structure between SysML (MagicDraw or Rhapsody) and requirements (Jama or DOORS NG). Contact Intercax to learn more. Get IBM Rhapsody model here.